GREGORY: Good evening. I'm David Gregory in Washington , in tonight for Brian Williams . House correspondent Chuck Todd. Chuck: Good evening, David . The president did a bit of a diplomatic dance today. 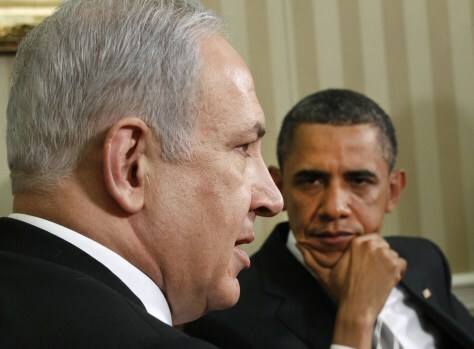 He was trying to bridge that rhetorical divide with the Israeli prime minister . It was no easy task. Twenty-four hours after igniting a mini firestorm with the leader of Israel , the president tried to cool tension. CHUCK TODD reporting: Obviously there are some differences between us in the precise formulations and language, and that's going to happen between friends . President BARACK OBAMA: That language disagreement: The president's declaration yesterday that any peace negotiations with the Palestinians begin with the assumption that Israel go back to the borders it had before the 1976 Arab/Israeli war. That sparked some pro-Israeli protests in New York today. TODD: President Obama is basically negotiating for the Palestinians . Unidentified Man: Today the president never uttered the phrase 1967 borders , but Netanyahu did. TODD: For instance, that while Israel is prepared to make generous compromises for peace, it cannot go back to the 1967 lines because these lines are indefensible. Prime Minister BENJAMIN NETANYAHU: Netanyahu argued that the demographics make it impossible to go back. A hundred and thirty settlements with more than 300,000 Israeli reside outside those lines . The tension in the Oval Office was clear as the prime minister offered an almost point by point rebuttal to Mr. Obama 's Thursday's speech. TODD: Because, as I told you in our conversation, we don't have a lot of margin for error. And because, Mr. President, history will not give the Jewish people another chance. Prime Minister NETANYAHU: He seemed a little bit like a hectoring college lecturer, and the president looked a bit like the student in the lecture who really didn't want to be there. Mr. JEFFREY GOLDBERG (The Atlantic): There was strong agreement from the two on Hamas , a group the United States has declared a terrorist organization, who's now aligned with the Palestinian government . TODD: Hamas has been and is an organization that has resorted to terror. It is not a partner for a significant, realistic peace process . Pres. OBAMA: The president could get another cool reception on Sunday morning when he addresses the largest pro- Israel American lobby, APAC . There, Israelis are hoping the president will announce that he's going to visit Israel next month. White House sources tell me that is highly unlikely, David . TODD: We'll be watching. Chuck Todd at the White House to get us started here tonight. Chuck, thanks very much. President Barack Obama meets with Israel's Prime Minister Benjamin Netanyahu in the Oval Office at the White House in Washington on Friday.